If your pup (or even your cat!) is in need of a good wash, the pet groomers of Maryland will offer you that and plenty more. From cut and blow dry to claw trimming, the personalized and expert services of Maryland’s pet groomers have it all handled. Here are the 10 best in the state! Bark in Style is a mobile pet grooming truck serving the Bethesda, Potomac, Rockville, Kensington, and Upper NW D.C. areas. They offer two types of grooming packages: the bath, brush, and tidy up, or the bath, brush, and haircut. Additional services, like Furminator and teeth cleaning, can be purchased a la carte. Karen’s Pet Grooming is a full-service pet salon with a range of services including bathing, dying, nails, ears, flea and tick treatment, and more. They’ve been in the same spot since 1989. Call ahead to schedule an appointment. Ann’s Quality Grooming and Boarding in Rockville, Maryland, is known for personalized care. Their certified, professional groomers can make your furry friend shine. Grooming options include teeth, nail, ear, and coat cleanings. The Grooming by Em staff are former veterinary technicians and bring with them a unique perspective to handling your pet. Their grooming menu is diverse, with different options for small, medium, large, and giant dogs. Bring your dog or cat in for a basic groom or a luxury spa treatment. Patricia Dee, master groomer, takes new clients only by appointment. She’s been grooming dogs for over 30 years. Services include styling, ear cleaning, pad clipping, shampoo, teeth brushing, and more. Make sure to check out her website before calling to see about current coupons. Jannet of Janneth’s Grooming understands that owning a dog is a privilege, and considers treating your dog as such, too. According to her website, “full service grooming runs an average of $60, but can cost anywhere from $60 to $100 depending on the dog’s breed, size, and general condition.” Additional services, including a pick-up and delivery service, are available for a surcharge. For over 10 years, Sean Patrick’s Pet Spa has provided Laurel, Maryland, with excellent grooming services. 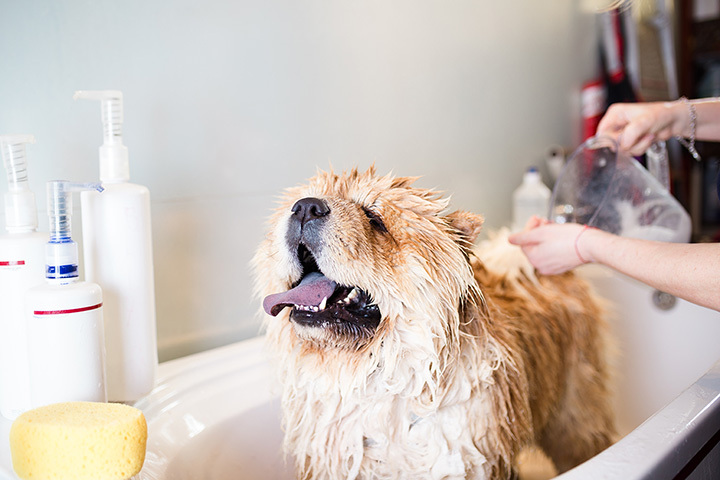 Grooming options include medicated, whitening, flea/tick and hydro-massage baths, fluff drying, styling, de-matting, de-shedding treatments, and more. For a full list, check out their website. Suds Up Dog Grooming is an at-home dog grooming service, run out of the owner’s house. As such, they only accept clients by appointment. But if you’re looking for a more personalized touch in your groomer, then you could do no better than Suds Up. Dirty Paws Dog Spa in Edgewater, Maryland, was named the 2013 Reader’s Choice by The Capital newspaper for their excellence in pet grooming. They use 100 percent bio-degradable products at their salon and maintain an emphasis on staying eco-friendly. Service members, don’t forget to take advantage of their military discount. Hair Off the Dog in Baltimore, Maryland, offers full pet grooming services in addition to their retail shop. Pet grooming services include baths, styling and hair cutting, brush-outs, nail, teeth, ears, and gland cleaning, hair dying, and much more. Make an appointment online or give them a call.